WNS leadership with Best Outsourced Contact Centre Award at BPESA BPO Awards. 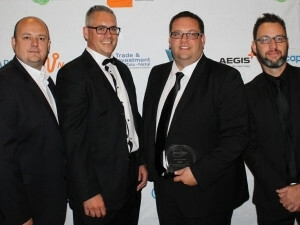 WNS Global Services South Africa, a leading global business process outsourcing company, received top honours at the 2015 BPESA Business Process Outsourcing (BPO) National Awards gala event, which took place on Saturday, 28 November at the GrandWest Market Hall, in Cape Town. WNS was recognised as the Best Outsourced Contact Centre in South Africa based on the company's commitment to clients and customers through demonstrating service excellence. Added to this coveted award, WNS also received the Best Sales Agent and Best Contact Centre Analyst awards as recognition for the outstanding achievements of these individuals. Johann Kunz, Managing Director of WNS South Africa, commended the company's achievement: "We are honoured to have received these esteemed awards, which reaffirms our position as the largest end-to-end BPO services provider on the continent. We remain committed to achieving excellence and delivering consistent business value for our clients," says Kunz. He adds the company would not be able to function without the people who work for it. "We run a people business and the awards we received are for the team, by the team and because of the team," he says. Kunz points to South Africa's recent nomination for the 2015 National Outsourcing Association's (NOA) Offshoring Destination of the Year award as testimony of the country's quality, world-class BPO service delivery. "This particular achievement would not be possible without the tireless contributions of the companies and individuals who make up our industry. Thus, we wish to congratulate all other industry players for the recognition received at the 2015 BPESA Business Process Outsourcing National Awards, it is most deserved," he concludes. WNS (NYSE: WNS) is a leading global business process management company. WNS offers business value to 200+ global clients by combining operational excellence with deep domain expertise in key industry verticals, including travel, insurance, banking and financial services, manufacturing, retail and consumer packaged goods, shipping and logistics, healthcare and utilities. WNS delivers an entire spectrum of business process management services such as finance and accounting, customer care, technology solutions, research and analytics and industry-specific back-office and front-office processes. As of 30 September 2015, WNS had 29 830 professionals across 39 delivery centres worldwide, including China, Costa Rica, India, Philippines, Poland, Romania, South Africa, Sri Lanka, United Kingdom and the United States. For more information, visit www.wns.com. BPESA (Business Process Enabling South Africa) is one of the official trade and investment bodies for the BPO and contact centre industry in South Africa. The aim of the awards is to recognise and reward excellence within the South African BPO/contact centre industry. The awards comprise 10 categories on an individual level and 15 categories on a company level. Nominees undergo a rigorous judging process and winners are selected by an independent judging panel.